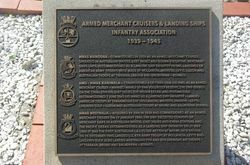 The plaque commemorates the Armed Merchant Cruiser and Landing Ships of the Royal Australian Navy and all who served in them during World War Two. During the Second World War, merchant vessels were commissioned into naval service as hospital ships, supply ships and armed merchant cruisers. HMAS MANOORA - Commissioned In 1939 As An Armed Merchant Cruiser, Operated In Australian Waters, East Indies And Burma Escorting Merchant Ships Until Recommissioned As A Landing Ship Infantry In 1943. Landings Of American Army Troops Were Made At Hollandia, Morotai, Leyte, Luzon And Australian Troops At Tarakan, Labuan And Balikpapan-Borneo. HMS-HMAS KANIMBLA - Commissioned 6 October 1939 (As HMS) As An Armed Merchant Cruiser- Manned Mainly By RAN Volunteer Reserve, The Ship Served On The China Station , East Indies, The Indian Ocean, and Persian Gulf. 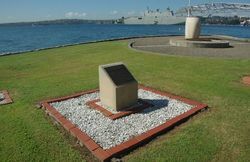 Recommissioned 1 June 1943 (As HMAS) As A Landing Ship Infantry - Landed American Troops At Tanamerah Bay (Hollandia) , Morotai, Panaon- Leyte, Lingayen Gulf-Luzon And Australian Troops At Balikpapan Borneo.